Important News Bulletin : MONSTERS ON THE PROWL! Werewolves and Vampires and Man-Thing... Oh MY! Master of the Picnic Arts? CURSE ME FOR A NOVICE! It rules us all. It counts our moments, our days, our years... our... lives. Such is the nature of mortality. We can try to ignore it's passing. However, it can can not be denied. With one day skipped over, one 48-hour period, between the previous installment and this... for those who were eagerly anticipating its being posted, it must have felt longer. (Of course, for those who had little care about it, time held them not in it's power. All I can say is that for ME it felt interminable). 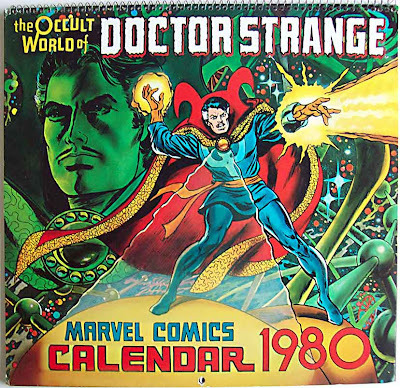 As a Doctor Strange "fan-site", and one that showcases the many wondrous Doctor Strange-related collectibles from within my Sanctum Sanctorum, I felt it appropriate to leave this single calendar for last. 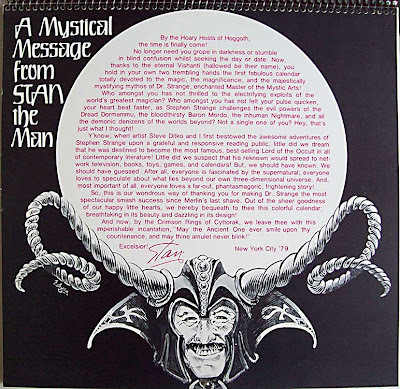 As such, I am pleased to show each and every image from this item, which as I'll relate at the end of the post - was a very important part of my early years as a fervent collector of Dr. 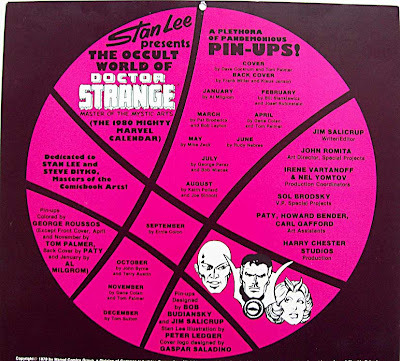 Strange comics and ephemera. 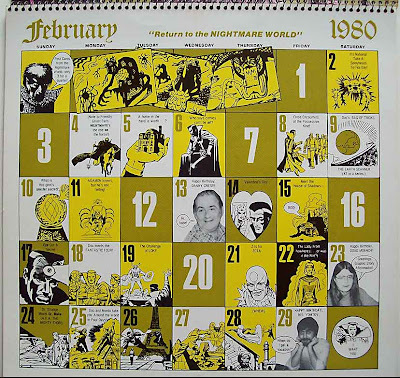 However, time's a wasting... let's go back in time... to 01980 * ! 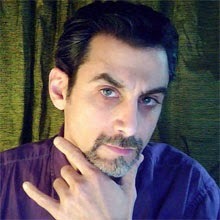 We are limited in our time, only the length of a single candle-wick, and as such, I'll keep my comments to a minimum. Instead, I'll let the fabulous works speak for themselves. 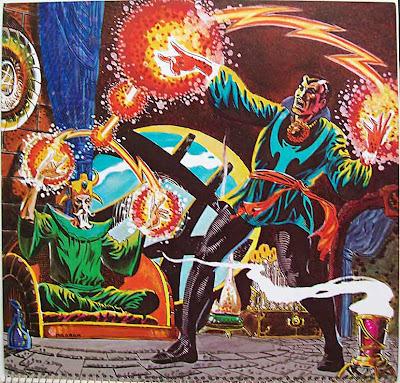 Click on images to cast an enlarging spell upon them. 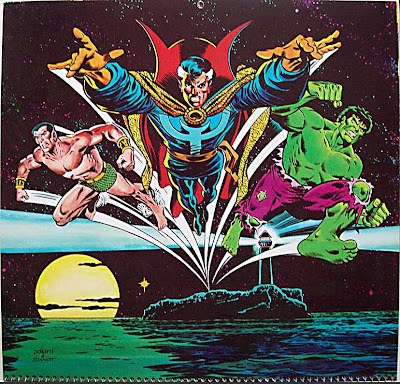 Prince Namor; The Sub-Mariner, Doctor Strange and The Hulk. 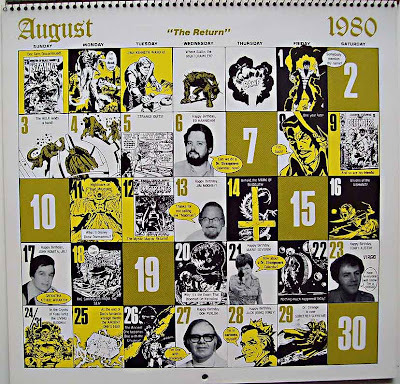 Back in the mists of time... 1980 through the rest of the decade, in the dim recesses of history when there was no internet... as a collector and fan, informational resources to aid in the search... the QUEST... for the back-issue tidbits and eclectica were few and far between. 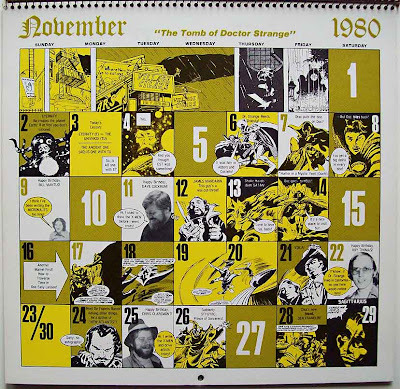 As a young fan, hooked on comics and the worlds of Doctor Strange, but with only a few then-recent comics to my name, I would utilize the clues and reprinted images within this calendar (and the others of the "Classic" series) to piece together plot-points and time-lines of Strange's publishing history. 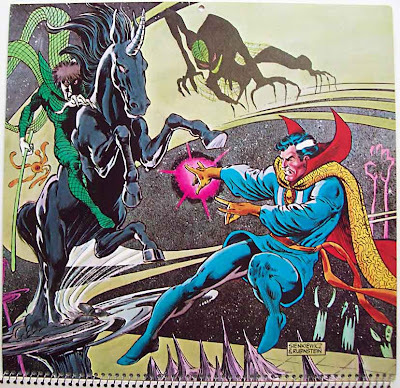 Many times I had only a single panel (or cropped portion of a panel), two-color reprinting of a scene from a critical piece of Strange's adventures with which to cobble together events and use as reference material to help FIND the issues represented within. 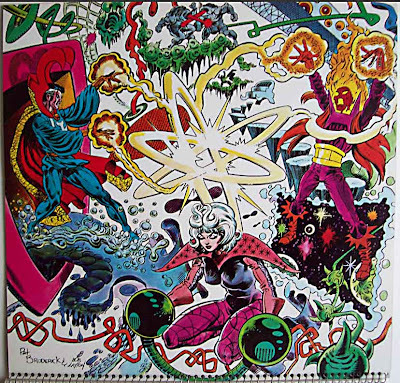 The tricky part was that many times, the scenes within the calendar were not from any actual Doctor Strange titled comic. 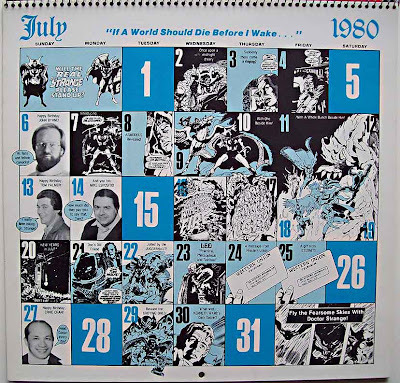 I'd buy some old comics, with giant gaps between issues, and use the information from the editorial boxes (those little boxes at the bottom of comic panels which explained where characters and events had occurred previously - those were invaluable to me) and my calendar to connect the dots, and aid me in my next leg of... The Quest! 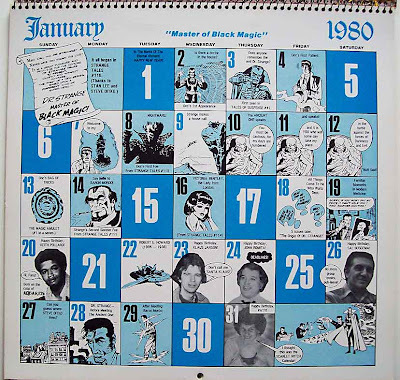 Of course, I couldn't very well take this giant calendar with me to the assorted darkened back-alley comic shoppes that were beginning to crop up from the late 1970's. No. 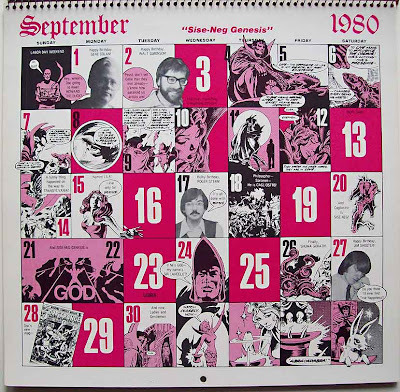 I'd be risking the "structural integrity" of the calendar (and myself) by being so outre with my nerditity. 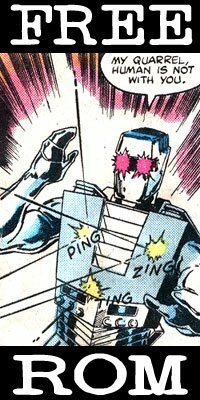 Instead, I used my almost photographic memory (which only works for visuals - not numbers, sadly) to scan comics while flipping through them quickly. 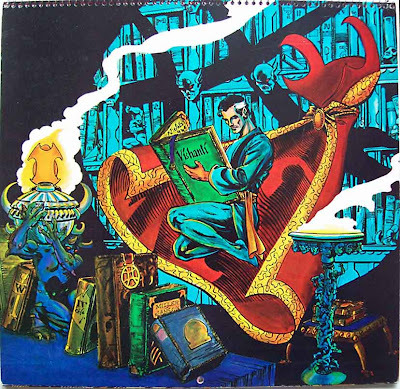 Searching for familiar scenes or characters who might be continuing a story, speed-reading captions and word balloons for salient key-words that might point me in the right direction of a worthwhile purchase. 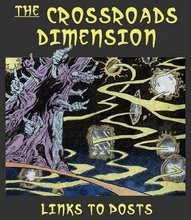 Bridging a gap in a storyline. Filling a hole in the collection. That need drove me onward for many years. 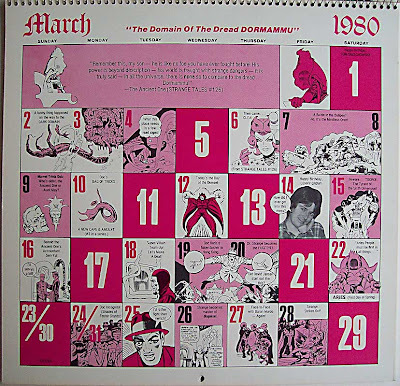 With little but this calendar as my guide. 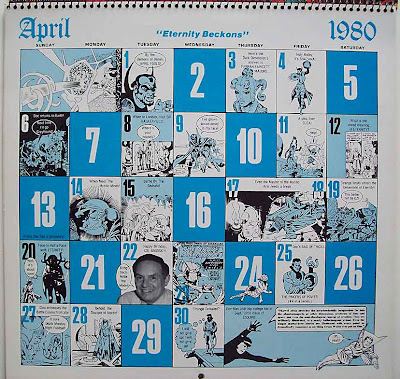 The subtle feeling of success, when I was able to locate a comic which held a scene that was reprinted in this calendar, was like a small shot of adrenaline which would be my fuel to go onto the next acquisition. And the next. And the next. 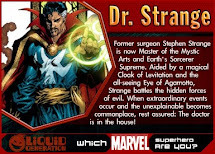 Until many years later, now... in the present... where I have every appearance of Doctor Strange. 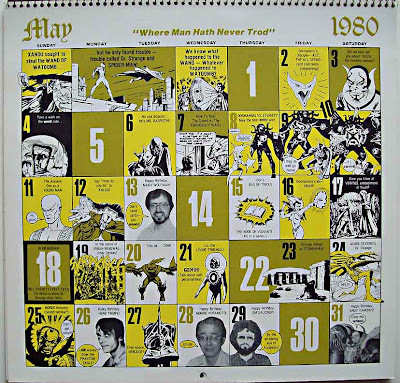 All his comics, guest appearances, cameos and even where he's a single head in a crowd scene. 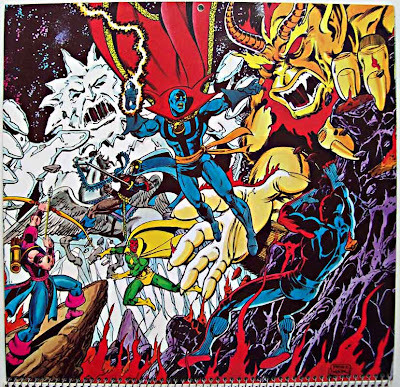 Some prized pieces that were obtained, weren't even comics at all. 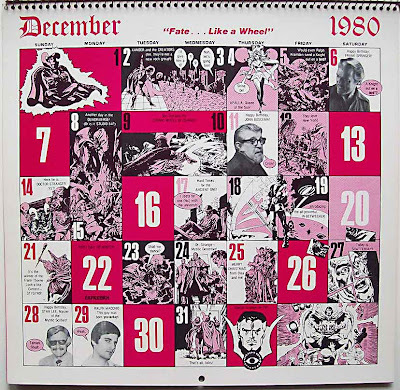 One such item, as shown in a tiny box at the bottom of one month... was an issue of Esquire magazine, where 1960's college hippies are interviewed about Dr. 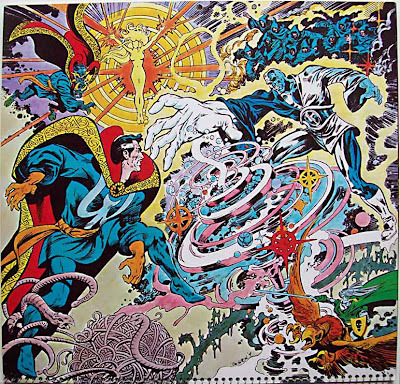 Strange (and Marvel as a whole). 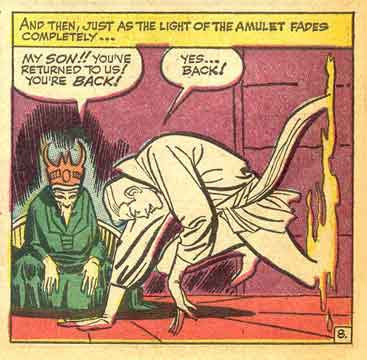 Much like Doctor Strange himself... striving to make his way back from the past... as the light of his guiding candle had long faded away. And so, I have brought you all BACK safely with me from the past. 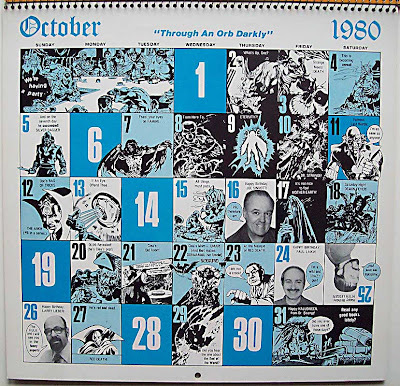 You see, THIS 1980 calendar was the same day pagination as the past year of 2008, and as such, I used it as my calendar for that year. 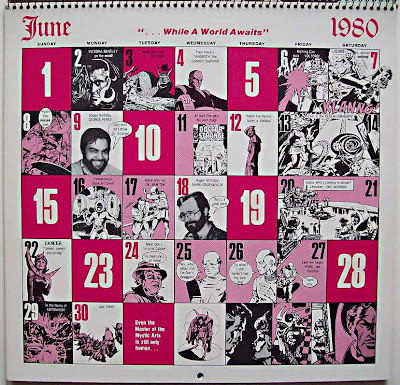 2009 is the same day pagination as 1981, so... I can recycle the past for my usage today. 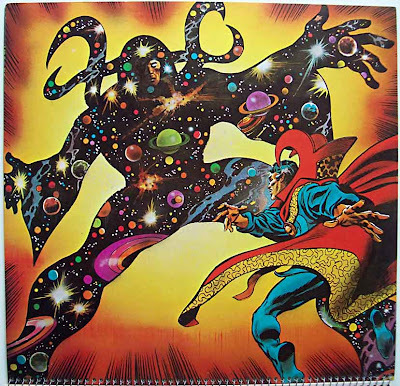 That Doc Strange calendar is fantastic! 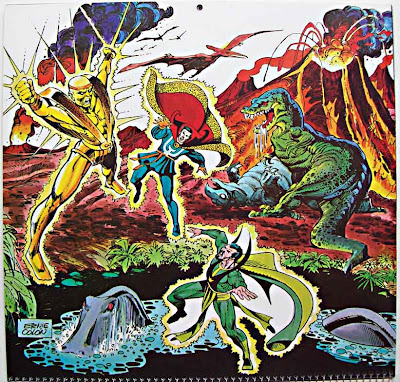 Man, Colan's art is amazing! 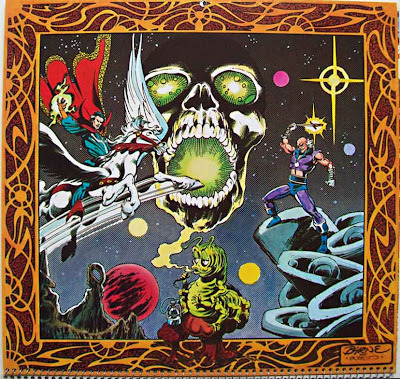 By the way, your ROM page for Mr. Mantlo, I've been remiss in saying: WOW! Spectacular stuff! And good job all 'round. 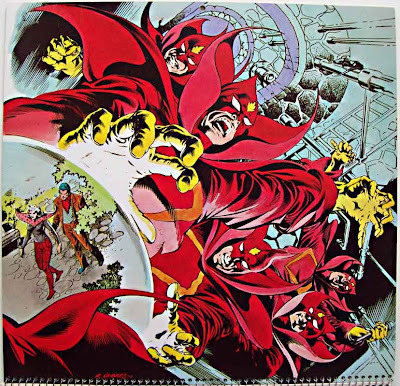 The Sienkiewicz art is heavily Starlin influenced. 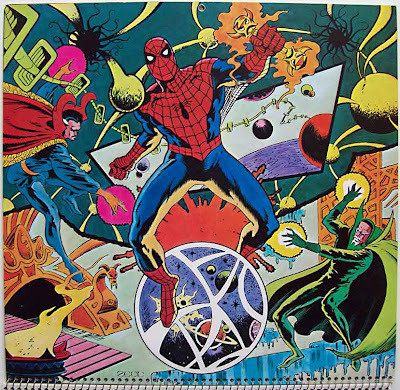 I didn't know that these calendars had this great art. I'm amazed. 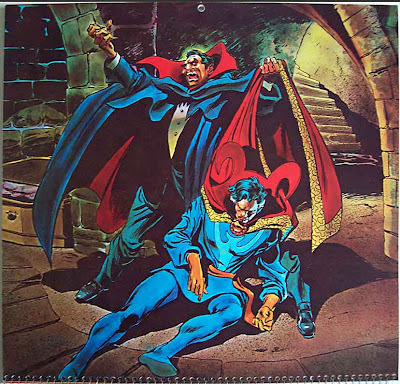 One of these calendars is for sale right now on eBay, but at $24.95, it's a bit to rich for my blood....regardless of my love for the doctor. It's chock full of gorgeous art, though, so thanks for sharing! April is AMAZING! Damn, I wish they still made them like this!